Spartanburg Educational leaders Drs. Laura Reynolds, Russell Booker, and John Stockwell provide insights to Spartanburg Herald Journal reporter Adam Orr (left) after they participated in a trip to explore the Finnish Educational System. Three words were voiced most frequently at a relaxed yet vitally important debriefing with Spartanburg Herald Journal reporter Adam Orr regarding the recent trip made by Upstate Educational leaders to Finland. There, educational outcomes for children have rocketed over the last twenty years. Orr has been following and reporting on the Spartanburg Academic Movement, sharing the community vision for improved student outcomes through our educational system. Before leaving Finland, Booker had already called his administrative team to shift some strategic plans and funding. Emboldened by seeing the theory of building lifelong learners actualized across the Finnish culture, Reynolds said she felt that those participating could no longer just share and admire the thoughts behind the practices they had seen. The experience was validation for what had been rooted in theory or quiet ‘dream’ conversations among educations. Having seen the dream lived means that now is the time to speak out - to take those theories and dreams out of the mind and heart and just do what needs to be done. “If we don’t agree with how something is being done, we have to call it out and just deal with the fuss it may cause,” Reynolds said. “The feeling of trust that permeates the schools and the culture as a whole makes the Finnish system fundamentally different,” Stockwell said. The majority of children ride bicycles to school which are left, un-chained, outside the school. When and how the curriculum is taught is left to the teachers. Examples shared with Orr include the 500-page national curriculum. That’s it – only 500 pages to guide educating a nation - from cradle to career. The national department of education leaves the implementation of the curriculum to the schools without the deep oversight and accountability issues present in the SC and US national system. Teachers internalize and respond to that deep trust, embracing the mindset that success of their community and nation is tied directly to the quality of their work with students. Teachers are well paid, though to dispel myths, they are not paid as well as doctors and lawyers, nor is every one driving around in a sports car. But not a single teacher had a second job. Teaching is considered an esteemed profession. Only about ten percent of those applying to get into teacher education programs are accepted and teacher turnover is small. Counting down the years to retirement isn’t the mindset as teachers often keep working in the system they love well into their sixties. Teaching is still an intense career, and none denied that three ‘best’ parts of the Finnish system are: June, July, and August. Their teachers appreciate as their summer break just like teachers here do, but there, teaching ‘summer school’ is a foreign concept. Play doesn’t just happen in the summer months and there are very few academically focused summer programs in the communities. Play is part of every day, and not just one part. Between each structured class time, children are sent out to play. Snow, rain, or cold do not matter. Play is vital part of the structure of their day. It’s also embedded into… structures. The US contingent was amazed with open classrooms and inventive resources to meet the sheer physicality that children bring with them into the classroom. “Nontraditional” seating was standard. Children were free to lounge across tables and chairs, unconfined. They even saw students ‘seated’ around a learning station where the seats were swings suspended above the table. But teachers aren’t playing when it comes to making sure every student’s skill grows. In fact, at the ‘elementary’ level, a teacher will follow her students for multiple years (yes, there too, the majority of elementary teachers are women.) Understanding between parents, teachers, and students grows over time – with all meeting regularly throughout the school year to discuss (not test) advancement through the learning goals. When a student struggles with a concept, the teacher has a deep understand of that child’s learning process and how to adjust. Running through the school wearing socks and no shoes, even sliding around adults, wasn’t seen as play, or disrespectful, but the natural state of how children move. And it was embraced, not chastised, and not seen as a safety risk. Learning is a lifelong endeavor – for everyone. The question to ask is “Do we have heart enough to lift up our weakest?” said Booker. The nation-wide commitment to “yes” being the answer is clearly the foundation upon which the Finnish educational system was built. However, it doesn’t stop with uplifting a child who may be struggling. It is about meeting people where they are. For instance, if a young person chooses to enter an internship in a vocational program and years later decides he or she wants to pursue a bachelors, masters, or doctoral degree, the system is there for them, providing free education throughout life no matter how far that individual chooses to take it. It allows for the whole person to develop and for lifelong learning to be the national way of life. “There are no dead-ends,” Booker added. The differences in the political structures of American and Finland were never part of the dialog and as those gathered knew, didn’t need to be. Politics and party are simply not issues at the table when the entire nation embraces education as a human right for which they all accept responsibility. Immigrants receive a year of intensive native language training so that they can integrate well into the learning and social environment. The lack of age-specific assessment allows students them to move forward from where they are, throughout the educational years. Formal school doesn’t start until children are 7 years old and if special needs exist, those are offered. · In Finland, the education system and schools function in a type of isolation from other community entities. There, businesses are not brought into the educational environment as they are here. Schools here benefit from many cooperative programs between local businesses and schools – from volunteers to funding support. · Parent engagement in US schools is high. Though parents engage in a minimum of three meetings with teachers each year in Finland, they are not involved in the day-to-day operation of the school through volunteerism and organizations like PTO/PTA, school improvement councils, etc. The sting to the team came with awareness that the ‘answers’ they were seeing in action had been close to hand for years. The irony was not lost on the group when Finnish educators explained that it was US based research related early brain development, and creating learning environments suited to the physical, mental, and emotional development of children formed the foundation for turnaround of the Finnish system. “As a culture, we didn’t listen to ourselves,” said Reynolds. No. Not one person in the contingent came back thinking we just needed to stick with the system and structures in place that aren’t working for all students. All came back inspired for continuing the dialog, and most importantly, for taking action based on the opportunity. · Members of the Upstate educator’s group posted regularly on social media using #SC2Finland. · What Works SC, a forum of the Riley Institute at Furman University included sharing from the team. · Local community gatherings are being scheduled for team members to share insights and follow up action plans with interested community members. · SCETV is in process with documenting the group’s experience and learnings to share to keep the dialog and action moving forward. “I did not see anything in the Finnish system that acts in cross-purposes with our goals here,” Stockwell said. …Assessments were used to steer instead of control. …Experienced teachers were allowed paid sabbaticals as part of a retention plan? Give those teachers with the most experience a chance to refresh and energize their passion so they won’t be counting the days until they can leave the classroom. …Companies provided career structures that valued and supported continuing education. Not just work-study co-ops for younger employees, but for older adults who want to add new skills? …a functional bond between parent, child, and school were expected from all? …every school served as a ‘lab school’ for teacher preparation and those guiding teacher preparation were as integrated into the schools as their students? … experiences and skills gained over time built into competency-based qualifications (stacked degrees/qualifications) that were recognized across businesses and industries? … most of our students aimed to earn a master’s degree? … years of work experience and competency building could translate into a vocation-based degree? …TEACHERS were recognized as the keys to quality in education? This ARTICLE along with PHOTOS was posted by Spartanburg Herald Journal as a result of this debriefing and his conversations with participants exploring the Finnish educational system. Local teachers excited to learn new practices to make the difference needed for students. Those were the words of a local educator willing to spend extra hours in training in the hope that the missing link in her years of effort to impact students had just been found. She said that in July, during SAM’s first Continuous Improvement training sessions. It was said again in September as a second group of educators received their first training. Why? They had just received permission to fail … forward. Cheryl Broadnax and Melissa McCoy are national leaders in embedding CI practice in educational settings. The equation of failure=success was never taught in school, and certainly not in professional educator training. But now it will be. In fact, it will be the muscle behind developing a wave of successes. Cheryl Broadnax, senior director for district improvement with StriveTogether and consultant Melissa McCoy came to Spartanburg to train educators in the hidden power in the muscle of failure. Breaking loose from the emotional/judgmental stigma attached to failure releases that power, they explained. When teachers, principals, and superintendents sit in the same room and acknowledge that failure is acceptable, something changes. That’s exactly what happened around the SAM table during the Continuous Improvement training sessions held July 30-31. It happened again September 5-6, 2018. All in - a group of educational leaders from SAM’s Four Schools Project train to make the difference for schools in high poverty communities. “This unleashes the power of professional educators. We can track what’s working and what isn’t and share that in a way that makes a difference on a very practical level,” said Broadnax. She experienced this first hand as she worked to embed continuous improvement science across the Cincinnati school district where she served as assistant superintendent. “This makes the invisible, visible,” explains. Mendy Mossbrook, Director of SAM’s developing Continuous Improvement Institute as she describes the process. “Instead of hiding development opportunities, we use the ‘current state’ to set goals and focus on improvement. It involves making small changes, continuously, with the expectation that these small changes add up to a significant difference. This is a very different approach than is familiar to many. The typical approach for change-making is to make a big goal or process shift that creates frustration and burnout when it is not obtained. This new approach builds toward success, not expecting it to be instantaneous, but sustained – the key to long-term impact,” Mossbrook explained. 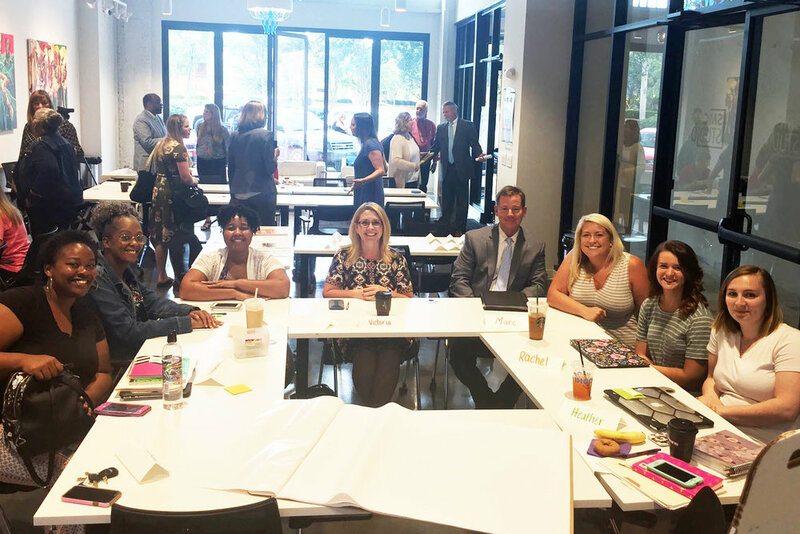 SAM’s first summer training sessions involved newly hired CI (Continuous Improvement) coaches and administrators from Spartanburg Districts 6 and 7 and launched SAM’s Continuous Improvement training. Over two days they worked to understand the process steps that would guide their work within schools participating in “The Four Schools” initiative. The effort targets work within the four county schools with the highest rates of poverty, a factor tied directly to currently low success rates for students within those schools. The CI work takes the process-driven analytical model common to business and industry and merges it with the intricate human/relational element that plays out in the teaching/learning dynamic. “Teaching is a matter of heart. It’s about relationships,” said Russell Booker, District 7 Superintendent, who participated in the training. So rather than looking at a low grade as a fly to be batted away while moving forward through curriculum calendar, hoping the next grade will be better, that grade is now the reminder a teacher to drop back into the relationship built with the student and have the student figure out what happened. That’s right, the student. If Joey didn’t demonstrate he’d mastered the skill, what does Joey think happened? What does the teacher think happened? Together, cause is identified and a change in strategy, an intervention, is planned. Broadnax calls the process “facilitating in the wild” due to the personalized nature of the work. It’s not just re-teaching a concept, it’s getting deeply into how each child is internalizing his or her own learning. After an intervention to improve a weakness has been planned (P) and tried (D), the results are studied(S). Then the action is either abandoned, adopted, or adjusted (A) and the process repeats. Even if a new strategy works, the process doesn’t end. A single strategy may not work in all applications, or for all students, so an ongoing pattern of monitoring long-term improvement begins, and most importantly, continues. It is the ultimate process of becoming “the best at getting better,” which can apply to everything from learning vocabulary words to managing stressors that distract a student from a lesson. By embedding PDSA and an acceptance of failure into the system in place, success starts emerging. As PDSA cycles continue, success is achieved with growth, not just an end goal assessment. Ultimately, small successes, based on identifying failures, build larger successes. By the afternoon of September 6, 29 educators were ready to head back to their schools and classrooms to start their first PDSA cycles. CI Coaches will be following those teachers and guiding their progression, helping to fine-tune the process. CI Coaches will share their work with follow-up coaching in November when Broadnax and McCoy plan to return. After participating in the July training, 100% of the participants said they will plan their next lesson differently as a result of what they’d learned and all 29 said they’d recommend the training to a peer. Embedding this process is its own PDSA. Ensuring responsive support is key to establishing a practice in schools that can continue. SAM has offered both – through the Continuous Improvement training launched in the summer of 2018, an ongoing effort to impact schools and educational success across Spartanburg County. SAM’s CI team - Dr. John Stockwell, SAM’s Executive Director; Beth Thompson, Director of Continuous Improvement; Trainer Cheryl Broadnax from StriveTogether; Melissa McCoy, Trainer and Independent Consultant; Dr. Glen Carson, SAM Director of Data Management; and Mendy Mossbrook, SAM’s CI Institute Director.